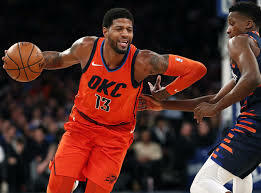 NEW YORK (AP) – Paul George scored 31 points and Russell Westbrook just missed a triple-double with 17 points, 10 rebounds and nine assists as the Oklahoma Thunder defeated the New York Knicks 127-109. The Knicks have lost six in a row and 14 of 15. They have dropped nine straight at Madison Square Garden.